> Purchase a nut mixture or roast your own up to a week before the party. > Roast the veggies a day or two ahead of time; allow to come to room temperature before serving. > Serve a high-end potato chip and warm them in the oven. > Set out potato buns with a simple horseradish dressing for sandwiches. > Serve ice cream and store bought biscotti for dessert. Top with whipped cream and Baileys liquor just before serving. Fat and Happy Food Blog Tips and Techniques: Talk to your local butcher, or the guy behind the meat counter- they will help you decide which cut of meat is right for you and how much to buy. Allow the meat to come to room temperature. Preheat oven to 450 degrees. Cover the meat in seasoning salt, pepper and minced garlic. Place the meat in a shallow pan, place in the hot oven for 6 minutes per pound. Then turn oven off and let the roast sit undisturbed for about 2 hours. Use a meat thermometer to test for doneness. Remove the roast from the ovenwhen it reaches 120 degrees, remove from the pan and set on a cutting board, cover with piece of tin foil and let it rest for at least 15 minutes before slicing. 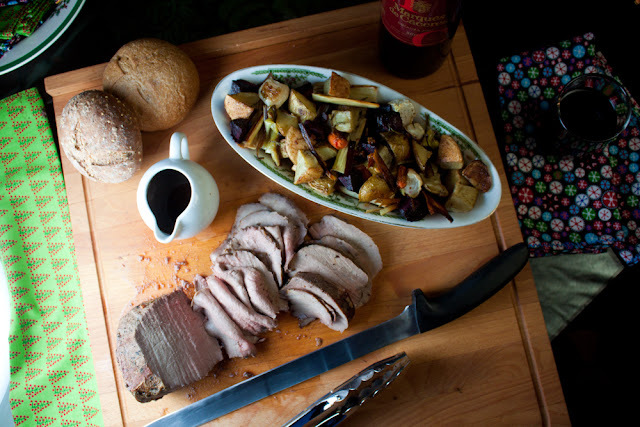 While the roast is resting, place the roasting pan over medium heat. Add the port, wine, cream and mustard - whisk together and let the mixture simmer about 10 minutes to thicken. Whisk in the butter and remove from heat. Add salt and pepper as needed. 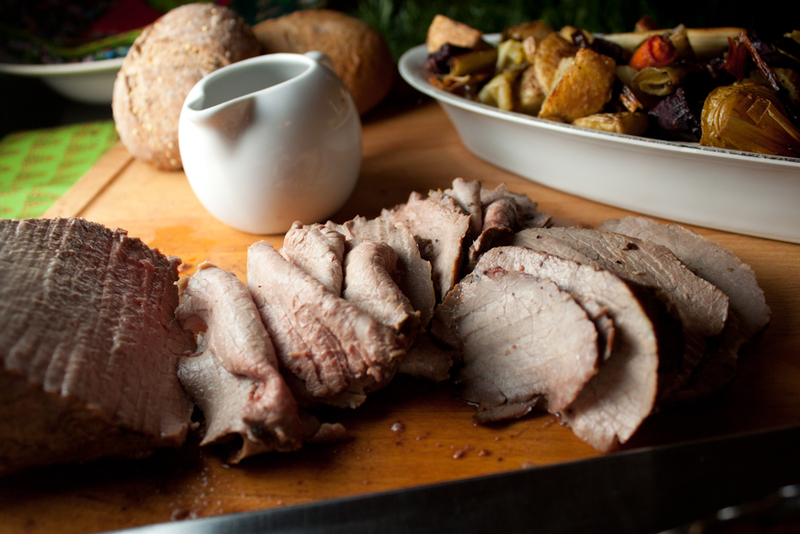 Thinly slice the roast beef and serve with the wine gravy. Roast in the oven at 400 degrees until the vegetables are fork tender. Look for my left-over Roast Beef Tatar Tot Casserole posting for New Years Day to use up any remaining beef.